NASHVILLE, Tenn. – (April 16, 2014) – Buckin Wild Music Fest, a new red-dirt experience that Country and Red Dirt music lovers will race out to get down-n-dusty in, is making its official debut this summer, July 18-19, at the Lost Creek Arena on historic Route 66 west of Erick, Oklahoma, hometown of Country Music icon Roger Miller. Filled with live music, from favorite red dirt rockers to top mainstream country acts, the festival will also provide fans with camping, barn dancing, a novice invitational bull riding competition and more. The festival also announces today several of the headlining acts for the 2014 lineup. Topping the roster will be the ACM-nominated duo Love and Theft, red dirt revolutionists The Great Divide, popular Texas Country artist Granger Smith, also known as his hilarious Redneck alter ego “Earl Dibbles Jr.,” the former lead singer of Cross Canadian Ragweed’s new group Cody Canada and The Departed, the traditional Bluegrass band HWY 351 as well as Mike Ryan, Red Dirt Rangers, Jacob Powell, J.W. Lane and County Road X, and more well-loved area artists including Joe Merrick (hit song “Quarter Horse Road”). Between the sets there will also be rounds featuring Nashville songwriters for guests to enjoy. Additional artists will be announced in the upcoming weeks. The 30-man novice invitational bull riding competition will be held Saturday morning and overseen by world-champion bull rider, and a founder of the Professional Bull Riders (PBR), Cody Custer, where he will be looking for future champions. The winners will share a $4,000 purse/100% payback. 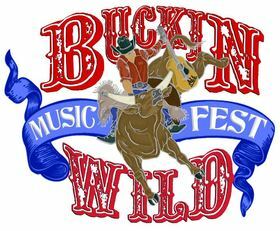 For additional festival updates visit www.buckinwildmusicfest.com, and check out the Facebook pages, Buckin Wild Music Fest and Lone Star PR.